In less than 12 hours an epic battle over Yachtclub district shall begin! The warm days are coming and everyone desires to wash off the sweat in the clear waters of Mojo River, but alas! 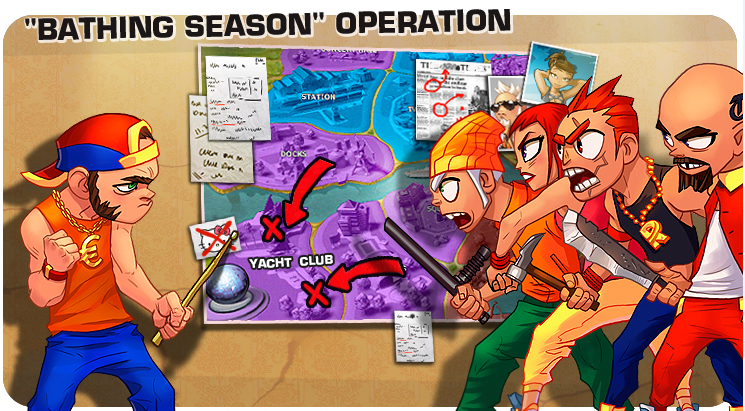 the Clubbers have occupied Yachtclub district and won't let anyone else wander around there without getting punished. The time has come for Urbans, Rockers and Pop to unite and show their resolve to fight shoulder to shoulder for the nice place under the sun! So, tomorrow, on Tuesday, May 20th at 7:30am GMT we encourage all the band leaders to place their flags at Yachtclub district! At the moment of next district redistribution the scores of top-5 bands will be calculated: Club bands will be summed together and compared to the sum of all the non-Club bands in top-5 on Yachtclub district. Shall the Clubbers manage to defend their district, all the Club-style bands in top-5 will get 160 rubies and 2000 stars each. Shall the opposite forces succeed in their assault, the non-Club bands in top-5 will receive 320 rubies and 4000 stars each. The prizes will be distributed between band members according to the band leader's decision. If the musicians' activity shall overcome the Administration's expectations, the prize fund may be increased! It's time to act - so we can idle on the luxurious yachts later! It's time to announce the winners of "Bathing season" contest! Five bands have fought over Yachtclub district fiercely and deserve their names to be carved on the monument of fame! Club was represented by Hello Kitty and Mojo Style bands, who have gathered more than 450,000 dominance points in sum and thus defended their homeland against the united forces of Rock, Pop and Urban who were represented by Mojo Stars, Legion of Rock and My War bands. The intruders have got almost 210,000 dominance points together. The abovementioned bands of all styles receive a prize of 160 rubies and 2000 stars. We humbly request the leaders of these bands to contact us at support@mojostars.mobi and let us know how to distribute the reward amongst their band members! As it was promised, in case of intense struggle the Administration may increase reward, so we've decided to hand prizes to the most active players who have earned the most dominance points during this event, and they are: LadyGaga, Prifect, Baki, otmopozak, Aloysia and Vladster! Hooray to the winners and all the participants of the event!! !